Faith during stormy seas - will it provide? Forsaken Dreams is an intriguing blend of romance and adventure but it is very character driven. Eliza and Blake are very easy to like, and I loved the historical atmosphere of how they were all struggling with the aftermath of the Civil War. It's written very realistically and the voyage was both literal and spiritual. Although Brazil is mentioned as the ultimate utopia - and readers may think 'Brazil? I am not interested in Brazil' this is not a novel about Brazil. It is about survival on the seas, and survival from the effects of a war which stripped faith from those on this journey (and perhaps utopia could mean wherever God is..). Blake's entire family was wiped out by Union soldiers, and just like many other Southerners after the Civil War, he seeks some peace of mind and peace of soul. The only way he can do that is to travel far away from the country who wronged him. Several travelers join in on his journey to Brazil, including Eliza, and former slaves. Eliza was a Southerner through and through - until she married a man from Pennsylvania. Even though that was before the war, no one can forgive Eliza, even after her Yankee husband is dead. No one wants to be around Eliza, and she attempts to keep her true identity a secret as she seeks new life in Brazil. The fellow passengers on the ship New Hope have secrets as well, and they unravel slowly during the voyage. Each character lends to a bit of a truth to the atrocities of the war, and puts a face to those who suffered, even the former slaves. Tyndall boldly portrays the story as historically accurate as possible with regards to how the Southerners relate to having the former slaves sharing their space with them, and I felt it was told with as much truth as possible. Slavery was a way of life that was an integral element to the Southern plantations, and after the war there was little hope of carrying on with those plantations without help. It is these former slaves and southerners - with pasts littered with transgressions such as thievery, alcoholism and prostitution - that make up this hopeful voyage as they yearn for a new beginning. The struggle with faith is a leading factor of this story as Eliza and Blake desperately try to make their peace with each other and with what God has thrown at them. Deftly portrayed, we can feel empathy even for the worst voyagers on the ship, though we really would like to know their secrets. There are some creepy and frightening moments aboard New Hope, and I can only imagine what is going to happen in Brazil. The minor complaint with this novel was the time shifts in the very beginning, but soon enough things evened out and I was able to invest myself fully in the story. 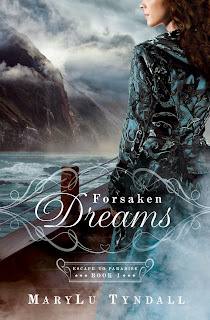 Forsaken Dreams is the perfect novel for those who are interested in seeing if romance can survive very extreme circumstances - and for those ready for a voyage with some intriguing characters! This is book one in a series, so there will be some things left unsaid which will make you want to read book two, just as I am eager to. I enjoyed this story for not being a predictable 'boy meets girl and sees the light' type of christian historical, as the author offers a plausible, well written drama that kept me intrigued throughout the novel. Even as we are left longing for book two, my fellow readers will come away with knowledge of the hopeful message of faith that satisfies any Christian reader. On the shores of Brazil, their Confederate friends are seeking a Southern utopia. But Hayden Gale and Magnolia Scott have different plans. Hayden is out for revenge and vows to keep pursuing his father—at any cost—whom he blames for his mother’s death. Magnolia is looking for a way out. . .and a way back home after her father insists their family escape the South following the Civil War. As the fledgling colony of New Hope struggles to survive, they both seek to use the other for their own purposes. Falling in love was never part of their plans. . . .
Read my review of the author's previous release, Veil of Pearls and Central Park Rendezvous which Tyndall co-authored.